So as I was grading a recent assessment, I noticed a little red exclamation point next to some student responses. When I clicked on the “exclamation point”, I was surprised to see a message that read “This response includes copy & pasted parts.” As I went through the entire assessment I noticed that some of the responses from the same students were being flagged as containing copy and pasted parts. When I confronted the students, about GoFormative detecting possible cheating, every single student I talked to confessed to cheating. Although I did not give the students specifics about what GoFormative detected, as to not give away my secret. So I wanted to pose the following questions, is there any other anti-cheating features that Goformative provides? Can anyone think of any related suggestions for GoFormative on how to cut-down on the possibility of students cheating? What do the rest of you do to minimize cheating on digital assessments? Glad to hear that this feature has been useful for you. 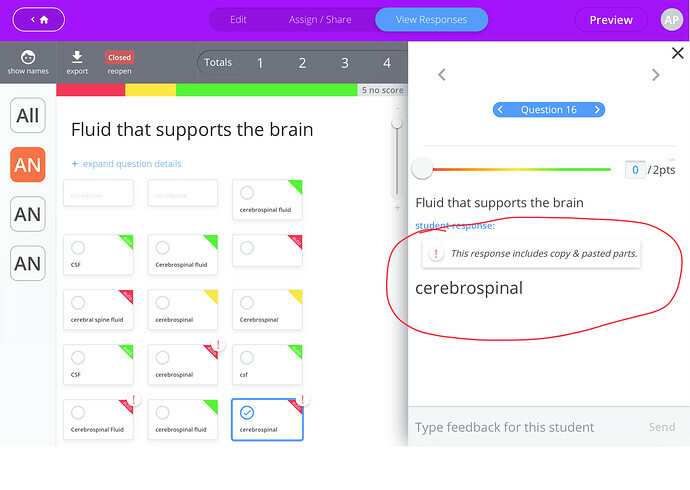 is there any other anti-cheating features that Goformative provides? Not currently, but we’d love to hear your suggestions. One thing we’ve heard from our @Certified_Educators is possibly to detect if a student is switching tabs. It’d be great to hear if this or anything else would be useful for you! This is an idea that I struggle with philosophically. I think I have several personalities on the topic. Erica #1 says, “We need to try and prevent/detect cheating with any technology advancement we can.” Erica #2 says, “Perhaps I need to reconsider the types of questions that I am asking. If the answer is ‘Google-able’ am I not providing learning opportunities that are rigorous enough.” Erica #3 says, “Why am I teaching like Google doesn’t exist? In real life what do I do when I need to know something…I Google it!” Ohhh the struggle!! I am also in the Erica 1, Erica 2 and Erica 3 camp. A while back I came across a quote that stated “I don’t teach the trivia. Trivia is anything that can be Googled”. While this is not necesarily true, I do teach objects in the solar system, for example, and well that can be Googled. There are also some things that my kids need to know off the top of their heads, and when you assess those, the issue of Googling an answer will invariably come up (Erica 1). However, what we (educators) would like of course is that students are able to think for themselves, and find answers when as they need them (Erica 3). In all honesty whenever I am trying to come up with a new lesson or idea, I will Google. In fact, isn’t that what we do when we share/clone formatives. Same copy/paste with a different name. What we do with them after is what is key (Erica 2). So of course, while I do not want my students to simply copy/paste, I do want them to be able to read something, integrate it into their knowledge base and explain it “in their own words”. I do love having the “this response was copy pasted”, but the way I see it is a little critically. Perhaps a student copy/pasted my sentence frame (if I gave it), or a difficult word (author’s name, for example). He/she may have even copy/pasted a quote and given attribution. Those, in my book are perfectly fine. Now, if the response is marked as copy/pasted and it is clearly plagiarized, then either my question was not the right question, or there is some reteaching that needs to be done, putting the onus back on me. This of course does not apply to proceedural questions. I know in Math this is a huge struggle (especially with sites like Wolfram Alpha). It would be interested to know your thoughts. I’m glad to know that I am not the only split personality out there! As a math teacher, sites like wolfram alpha can make my life difficult. However, I am lucky enough to be in a district that has provided me with a tool to be able to lock my students’ computers. When they are taking a test, I am able to lock them into Formative and not other tabs or apps will be allowed to open. This prevents the cheating aspect, but not personal struggle. Let’s face it, if in the future my students need to calculate the volume of dirt they need to fill their garden, but can’t remember how…they will turn to Google or whatever future device/application is around at the time. They all also have calculators in their pockets 24/7 with their phones unlike what we had as students. When I think about your situation, I wonder if there is a way to fine tune the anti-cheating feature so that the exact copied parts show in another color. This way, you will know if they have copied your sentence frames, the author’s name, etc. Just to add on, it comes with Formative premium! This is a super creative idea. I’d love to hear if it’d be helpful for others! I know it would help math teachers with those calculation sites that kiddos could be using. There are certain things that I am ok with students copying and pasting like Mariana said…complicated names, etc. It would also help for documentation purposes and meeting with parents. Especially coupled with a printing feature. I agree. I walk around constantly as well as watch their chromebook screens. Another idea would be to work towards applying the student centered approach where the teacher guides and asks probing questions, students discuss and then the teacher guides students through what they have learned. I think this color coding idea would be awesome. This would definitely help identify which parts were copied and make quick determinations as to the cheating/no cheating aspect. Thanks Mariana! I can see how this would be super helpful! Wanted to put in my 2 cents; some of it overlaps. Thanks for reading anyway! That is the point we need to emphasize. Yes, they can cheat and get grades. Yes, that is a short-term solution. It will not serve them long-term. So it’s a twofold solution with a lot of work involved. Teach them to love to learn and we build questions/quizzes that require them to think. Thanks for making me think on spring break!